Explanation: What's happening outside this cave? Nothing unexpected – it's just the central band of our Milky Way Galaxy passing by. As the Earth turns, the band of our Galaxy appears to rotate and shift along the horizon. 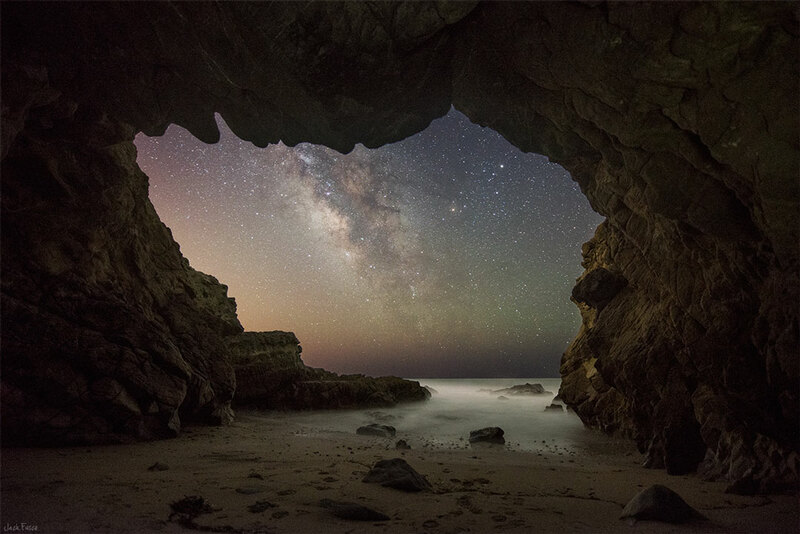 The featured image was taken by a photographer who professes a passion for locating sea caves, and who found this spectacular grotto in Leo Carrillo State Park near Malibu, California, USA. After some planning, he timed this single shot image through the 10-metre high cave entrance to show the Milky Way far in the distance. In the foreground, several rocks about one metre across are visible. Visible in the background starscape are millions of stars including the relatively bright and orange Antares, situated just to the right of the image centre.